Jim P. here in lieu of Amy. I don’t usually cover the Friday NYT beat, but I’ll do my best. Lucky for me, Damon (who goes by Joe Pancake in the comments on this site), handed me a doozy of a grid to work with. Lots of goodies here! I’m really diggin’ SPLITSVILLE, BEER BELLY, VAGABONDS, PUT PEN TO PAPER, POLICE CAR, HANK AARON, “ARE YOU BLIND?”, STEAMBOAT, SCORPIO, GASBAGS, SPACE RACE, EMPORIUM, “SO AND SO,” PIGLET, and LUMMOX. Whew! That’s outstanding fill! Oh, and CARLIN and PAVLOV. Very nice! UPPER LIP feels like a partial without the “stiff,” though it’s in the clue [Something that may be stiff]. And I figured that [It might include “New Folder” and “Close Window”] wanted something MENU, but I tried EDIT before getting FILE from the crosses. All this great fill is countered by the usual crosswordesey suspects such as APIA, OPTO, ORA, LOM, GRO, and AYLA. So there’s a real dichotomy here between that stellar stuff and this old kludgy stuff. But at the end of the puzzle, the sheer magnitude of great fill overwhelmed the gluey bits. GUFF [Insolent talk] is a great starter to the grid, but who else put SASS there? Come on, I’m sure I’m not the only one. That made that upper corner tough and it was a long time before I could see GASBAG (1d, [Wind sources]). Interesting to see BEER BELLY (20a, [It’s no six-pack, ironically]) here. According to Alex Eaton-Salners’s constructor notes on Tuesday, that was his original intended revealer for the puzzle that ended up using BEER INGREDIENTS. And RETRONYM [“Rotary phone,” for one] is also interesting. Wikipedia calls these “terms renamed after something similar but newer has come into being.” Can you think of some other examples? The Wikipedia list includes “cloth diaper” and “Classic Doctor Who” (as opposed to NuWho). 23a [Where the brachialis muscle is found]. ARM. This sure looked like it had something to do with the lungs. I resisted the urge to ask my doctor wife, but since I had MENU in place, I was suspicious it might be ARM. 40a [Something New York and Los Angeles each have]. TIMES. Ah, I get it now. As in, New York Times and Los Angeles Times. Tricksy. 60a [“Seven Words You Can Never Say on Television” comedian]. Obviously the great George CARLIN. But I doubt that his “seven words” holds true anymore. See the video below which includes some additional words for consideration. Still NSFW, though. 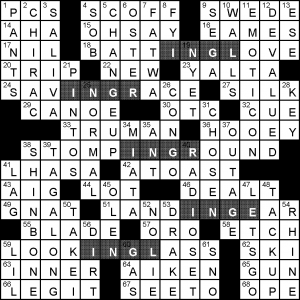 Some trite crosswordese bits hold the grid together, but good gravy, there’s a lot of good fill here. 4.5 stars from me. A theme that’s easier to grok than to explain. Two part phrases are made up of an initial -ING phrase followed by a G word. The G disappears, and wackiness ensues. Most of it lands, though strangely, I found the finale, LOOKINGLASS, the weakest of the set. I’m not sure if I am the only one, but I really struggled for traction at the top of the puzzle. I ended up regrouping at the bottom and working my way up. This entry was posted in Daily Puzzles and tagged Chuck Deodene, Damon Gulczynski, Damon J. Gulczynski. Bookmark the permalink. Yes Jim, I had SASS for the longest time, too. Super NYT! Great start to Friday. How about “film camera”? They are still in use, so we need the retronym. “Rotary phone” reminds me of our recent stay in Harpers Ferry, WV. The hotel had a pay phone. It wasn’t a rotary phone, but still. I haven’t seen one of those in years. It has a coin slot for purchasing apps, I guess. I couldn’t locate the camera. Agreed. Can’t imagine asking more from a Friday puzzle. Speaking of SASS, anyone else go for REVLON before PAVLOV as a [Big name in conditioning]? yes, SASS at first but I knew those were FILE MENU options so got rid of it real quick. That was a gem. The bits of crosswordese are more than excusable. GOMER stumped me for a bit. I hadn’t seen that general definition. Pretty sure that’s the origin of GOMER Pyle. I was surprised by GUFF — I’ve always taken it to mean hot air, BS, the kind of thing GASBAGS say endlessly. But Google tells me that ‘insolent talk’ is a secondary meaning (depending which source you go to). 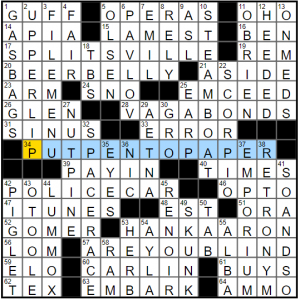 Good puzzle overall, but I balked at EMCEED and didn’t care for the SINUS clue. Isn’t that what one of the Martins calls a ‘sea anemone’ clue? As in ‘kind of anemone”: SEA. 23A:ARM — I guess you thought of lung because of “bronchial”. “Brachial” = arm. Easier for historical-instruments fans to guess because “viola da braccio” (of the arm, as opposed to “da gamba”), whence also the German “Bratsche” for “viola”. Also a connection to the French Jambe for leg, and the food Jambon. Brachiation is a locomotive process unique to apes.